Many people think cannabis legalization won't happen until Congress passes legislation to end federal marijuana prohibition. However, John C. Yoo - who is perhaps best known for his Bush-era Justice Department memos that stated torturing detainees is not a war crime - says the president could officially end cannabis prohibition in states that have legalized marijuana for medical or recreational purposes. "I would say that the president or Attorney General Barr could legitimately say, 'I'm going to withdraw the DEA and I'm going to withdraw federal law enforcement on marijuana,'" Yoo - who is now a professor at the University of California's Berkeley Boalt School of Law - said during a panel discussion organized by the conservative-leaning Federalist Society last month. Not only does Yoo believe the president has the power to recognize the legitimacy of legal states, but he also has a obligation to stop waiting on Congress to take action on cannabis prohibition. "The right thing to do as an attorney general or president is to order the withdrawal of all federal law enforcement from those states that have legalized the sale of marijuana," Yoo said. But that move won't likely come from Barr, who is still awaiting confirmation on his appointment as attorney general. During confirmation hearings, Barr stated his support of prohibition (though he added that he does not intend to interfere with states that have legalized cannabis). There have also been rumors in the past that Trump may make such a move and attempt to push widespread cannabis reform. 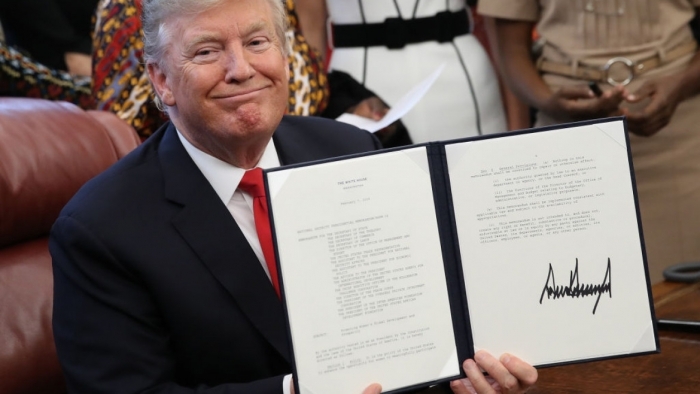 Frankly, we're surprised it's taken this long since Trump loves posing with his own autograph as in the picture above.